Task: Website template customization for a medical school. The website of a local medical school was in desperate need of a facelift. They went ahead and purchased a great looking template from one of the many online template stores. Later, they realize that to gain a crisp, professional look this template needed to be customized. Customize HTML-based website template: add new pages, update CSS and color scheme, add graphics, optimize current pages for the search engines. Customize Flash header: change and add new buttons and logo. Create form validation. Convert video files and embed those in Flash. United Medical Institute is a vocational education facility specializing in excellent medical training and education in Sacramento, CA. The school is built on an outstanding reputation for providing quality education in the health care field. SOLUTION: Artisan Productions customized a Flash header and a website template, added graphics and changed colors. 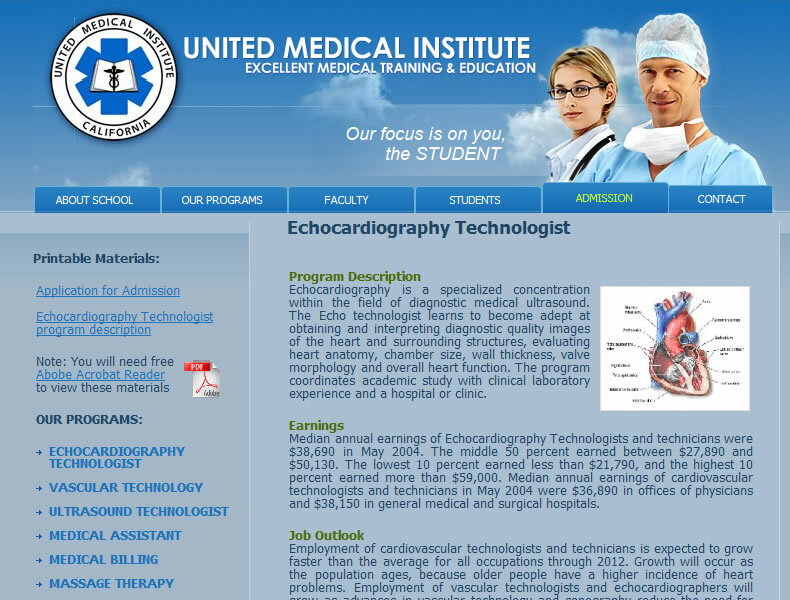 Unitedmedicalinstitute.com went through major website changes in just a matter of a few days. SEO optimization was applied to all of the pages. Moreover, the old website structure was kept unchanged for the search engines to be able to reach all of the registered links. User-browsing experience was enhanced by implementing embeded Flash video files on the site.